Playground workouts are an excellent way to get outside and breath new life into your stale workouts. Nothing is better than getting out in the sunshine and fresh air while unleashing your creative nature with some workouts you may not practice in a commercial gym. 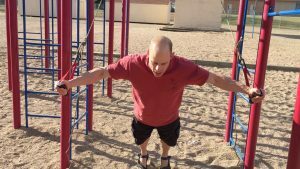 While a playground workout may seem simple enough, I’ve learned a few things over the years regarding what to do. How do you find a suitable playground? The first thing to consider is where to find a suitable park or playground. Ideally, you want to find a public park, or even better, a calisthenics park. These areas have the best chance of supplying you with plenty of metal bars and elements to use for a wide range of exercises. School playgrounds can work, but they or not always suitable for adult workouts. Access to school playgrounds is also mostly available well outside of school hours. I recommend using the maps app on your smartphone to find local parks. 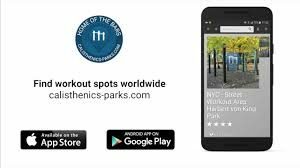 You can also download the Calisthenics Parks app which can help you find local parks for a good workout. The Calisthenics Parks App is a simple way to find local parks and playgrounds. Once you’ve located a suitable calisthenics park, you’ll want to make sure you bring a few essentials. Be sure to bring the same items you would use for other outdoor activities like water, sunscreen, food and appropriate clothing. I also recommend keeping your smartphone on you so you can keep track of the time since there aren’t any clocks out there. I also recommend bringing a suspension trainer to give you more variety and progressive challenges you may not get with static steel bars. Bringing a weighted implement like a kettlebell or sandbag can also give you some other options. A simple suspension trainer can add variety and progression to any playground. You may also want to bring a towel and a pair of workout gloves. A towel can be used as a mat on the ground or rough surfaces and to wipe the water off of any wet bars after rainfall. Gloves can give you a bit of comfort and protection against chipped paint and rusty edges. One of the best Human Growth Hormone benefits is that it allows you to boost the muscle strength. Playground workouts are an excellent opportunity to bring a sense of play and fun back into your workout. It’s fine to stick to your usual routine, but feel free to be a kid again and play around in your new environment. Challenge your buddy to a pull-up battle, or mix some field sprints in with your normal ab routine. You can even bring your dog to the park and play fetch. See how many reps you can get in before Fido brings the tennis ball back to you. Above all, get creative and have fun. Exercise isn’t meant to be a chore and playgrounds are a great place to remember this fact.